This high quality, Refurbished machine is a great opportunity to own a De'Longhi fully automatic espresso machine. 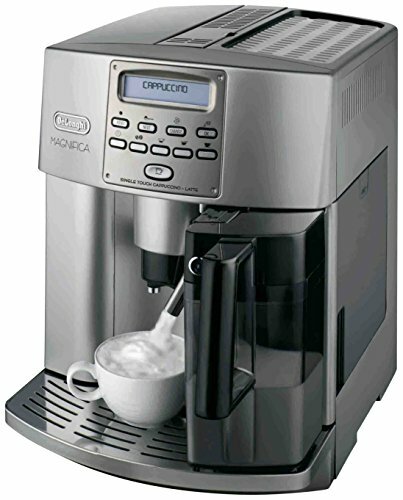 Capable of preparing espresso, Coffee, cappuccinos, Latte drinks, and more, this super-automatic 1,150-watt machine provides an array of convenient features. Its height-adjustable Coffee spouts make it easy to brew directly into espresso, demitasse, or 12-ounce Cups, and the instant reheat function keeps the machine at an ideal temperature, no matter how long the interval between Cups. The espresso maker also comes equipped with digital programmable menu settings that allow for setting the clock, start time, and one- to three-hour automatic shutoff, as well as adjusting the water hardness and temperature of the Coffee. There are five settings for Coffee strength-extraamildd, mild, regular, strong, and extra-strong. Plus, three buttons allow for easily choosing the cup size-ristrettoo (small), espresso (medium), and large (American Coffee). the espresso machine also offers a unique beans-to-brew system that includes an integrated conical burr grinder with adjustable fineness settings that automatically grinds Coffee beans right before brewing for exceptionally aromatic espresso.